Kris Bensler and her husband, Bill, have been loyal supporters and active participants in Steamboat Institute events since its inception in 2009. They have made a tradition of hosting the popular welcome reception for major sponsors and speakers for the annual Freedom Conference in Steamboat Springs each August. The Benslers have called Steamboat Springs home since 2005, after spending many years vacationing in the Yampa Valley. Kris served on the Yampa Valley Health Care Foundation Board for 11 years, chairing events and helping to raise millions of dollars to benefit Yampa Valley Medical Center. Prior to moving to Steamboat in 2005, Kris was involved in several philanthropic efforts in the Greeley (CO) community, including the American Cancer Society, United Way, Boys and Girls Club, Greeley Philharmonic and other non-profit organizations. 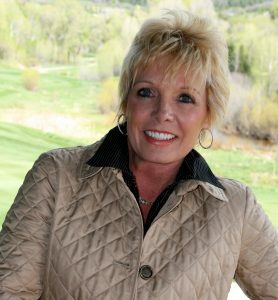 She served for 13 years on the Board of the Northern Colorado Medical Center foundation, working on various campaigns and chairing events. Kris is a Colorado native, having grown up in Fort Morgan. She received her Associate Arts Degree at a private college in Arlington, Texas, then returned to Colorado where she was a district manager, overseeing 15 stores, for Fashion Bar Corporation. Kris and Bill (CEO of Flood and Peterson Insurance, Inc.) are the proud parents of Delaney, who will be graduating from the University of Denver Daniels College of Business in 2018. When they are not working on behalf of various philanthropic and conservative causes, they enjoy traveling, hiking, golfing, fly fishing, attending Strings in the Mountains concerts, Colorado Avalanche hockey games, Colorado Rockies baseball games, and DU games and events.